Relax in your favorite easy chair and enjoy these great old time radio Christmas classics. Or if you’re taking a trip to Grandma’s house for Christmas, take along this collection and enjoy Christmas cheer as you travel. These classic radio shows will take you back to simpler time, when familes gathered around the radio to listen to their favorite shows. Back then, Christmas was a special holiday. It didn’t start in September, but a few days before the big day. 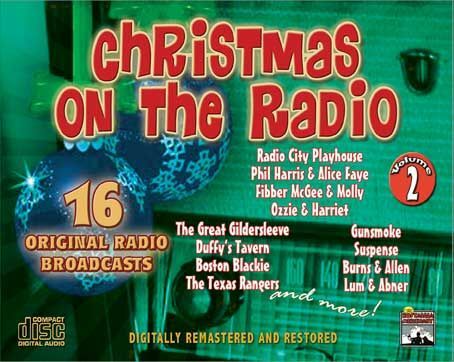 Christmas On The Radio Volume 2 includes 16 original Christmas and Holiday radio broadcasts. Fibber McGee & Molly – Early Christmas Shopping 12/19/44, Ozzie & Harriet – Sensible Christmas – 12/19/48, Jack Benny – Christmas Headache – 12/14/52, Duffy’s Tavern – A Christmas Carol – 12/21/45, Archie Andrews – Christmas Shopping – 12/13/47, Boston Blackie – Rings For Santa – 12/22/48, Radio City Playhouse – Twas’ the Night Before Christmas – 12/25/49, Great Gildersleeve – Leroy Sells Christmas Trees – 12/21/51, The Saint – Christmas Jewels – 12/24/50, Texas Rangers – Christmas Payoff – 12/23/51, Gunsmoke – Christmas Story – 12/20/52, Suspense – Holiday Story – 12/23/48, Burns and Allen – Santa’s Workshop – 12/23/41, The Six Shooter – Britt Ponsett’s Christmas Carol – 12/20/53, Phil Harris & Alice Faye – Jack Benny Plays Santa – 12/19/48, Lum and Abner – Thanksgivng / Christmas in Pine Ridge.